In Japan, the New Year is all about starting the year off fresh, so there are many things done before January 1st in order to prepare for a brand new year. New Year’s is a time to clean out your house, get rid of things that you don’t need, or pay off your outstanding debts. It’s a very busy time of year, all ending with eating traditional New Year’s foods, or osechi ryori (お節料理). Each osechi holds a special meaning for a prosperous new year based on their colors, shapes, and names. The first three days after the New Year are called shogatsu sanganichi (正月三が日). These are days of rest, when most people take off from work. Because of these three days, households used to spend the time leading up to the new year making enough osechi ryori to eat on shogatsu sanganichi so they won’t have to make food on a day when they’re meant to be resting. Recently, however, people’s lives have become too hectic to make a whole set of osechi ryori on their own so they have turned to stores and restaurants for help. Stores and restaurants typically have pre-made osechi ryori where consumers can buy what they don’t have time to make. 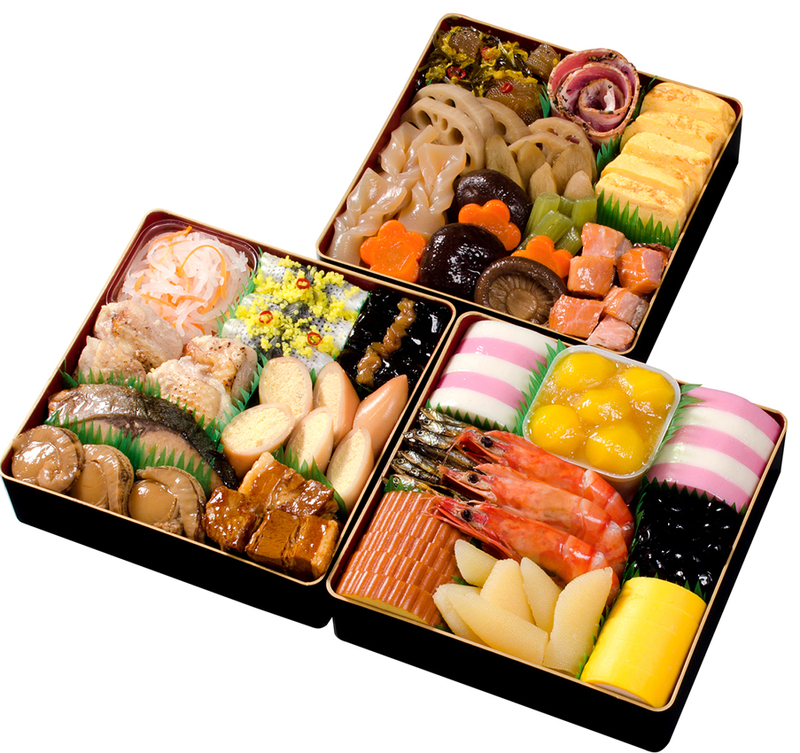 Osechi ryori is traditionally served in a jyuubako (重箱), lacquered, multi-tiered food boxes. Jyuubako for osechi ryori can usually range from two to five tiers, but the most common is three tiered with the food arranged in sections. The top two tiers are usually salted, preserved foods that can be snacked on throughout the meal, while the bottom tier is usually reserved for the main part of the dish. The tiers will be set out and people will eat from the boxes communally on New Year’s Day. Kamaboko (蒲鉾), a steamed fish cake, is also commonly eaten. Kamaboko’s half circle shape is similar to the first sunrise of the New Year. Tazukuri (田作り), which are dried sardines simmered in sweet soy sauce, are also common to eat. The literal translation of the kanji is “rice patty maker,” as they were historically used as fertilizer for rice fields. Because of this, it’s eaten as a wish to bring an abundant harvest in the new year. Konbu (昆布), kelp, is eaten because the name sounds similar to the Japanese word for happiness and joy, yorokobu (喜ぶ). Datemaki (伊達巻き), a sweet, rolled omelet mixed with fish, is commonly eaten because the shape is said to resemble a scroll. With the symbolism of a scroll, a wish can be made to help with culture and scholarship in the coming year. Kazunoko (数の子), salted herring roe, contains thousands of eggs clustered together and is eaten to wish for fertility and a bountiful harvest. Kurikinton (栗きんとん), chestnuts mixed with mashed sweet potatoes, is eaten because of its rich gold color in hopes that it will bring wealth in the coming year. Renkon (蓮根), or lotus root, is eaten because its many holes allow one to “see through” to the New Year. Another must-eat during the New Year celebrations is mochi, or pounded sweet rice. Traditionally mochi was pounded at home before the New Year, but it’s much more common these days to buy pre-packaged mochi to take home and cook to save time. Ozouni (雑煮), or “mochi soup,” is an especially popular first meal of the New Year. How ozouni is made varies greatly by region, using a bonito and soy stock in the Kanto region and a white miso stock in the Kansai region. Even the shape of the mochi changes by region; Kanto preferring squared kirimochi (切り餅) and Kansai using the round marumochi (まる餅). Along with the mochi, many things can be added, from chicken or fish to leafy vegetables like spinach or mizuna. Eating New Year’s food doesn’t necessarily begin on New Year’s day, but techinically on New Year’s Eve. It’s tradition to eat toshikoshi soba (年越し蕎麦), which translates literally as “New Year’s Eve soba” or “year-passing soba,” while waiting for the 108 bell gongs from Buddhist temples to welcome in the New Year. Soba are buckwheat based noodles, and are eaten hot, with additional ingredients that vary from household to household, but some good general ingredients include kamaboko or spinach greens. Because of the noodle’s length, it’s considered to bring longevity and because of the thinness of the noodles, as opposed to the thickness of udon noodles, they are easier to bite and are considered to bring an easy cutoff of the old year to the new. Eating toshikoshi soba is also supposed to help bring fortune in the new year as, historically, goldsmiths would use balls of buckwheat dough to help clean gold powder off of the floor. Eating soba can be considered “gathering gold” for the coming year. At Asahi, you can buy every type of osechi-ryori mentioned in this article, along with others. Some osechi come in sets with a variety of sweet and savory flavors, others are sold individually. Most of the osechi are available in the freezer area, just defrost and display in your own containers. You can also pick up pre-cut mochi while you’re in, too, whether you prefer kiri or maru mochi. Fresh toshikoshi soba noodles are also available in the freezer case. Make sure to start the New Year off right by eating osechi ryori!